As the saying goes, time flies, and it's hard to believe that we're gearing up for CES 2013. I'm no stranger to the largest electronics show in the U.S. (this is my fourth CES, after all), but since I'm kicking off 2013 with a new company, my bag of goodies is a bit smaller this year. I've been on the Apple side of the computer camp since 2008, and for what we do, it works perfectly. This isn't my favorite MacBook (or Mac in general, for that matter) that I've ever owned, but it gets the job done and provides a large enough hard drive to store countless raw video clips. After six months of carrying the Galaxy S III, the Galaxy Note II has become my daily driver. For business trips like CES, it's the perfect smartphone: in addition to a killer feature set, the battery life is impeccable. It's the one device that I can make it through the day with and not have to worry about it dying halfway through a series of meetings (to this day, I've been unable to kill it). Historically, AT&T's LTE has worked well (comparatively speaking) in Las Vegas, though I'm carrying the Motorola DROID RAZR HD as a backup just in case. I've used Canon video cameras in the past, so while this particular one is new to me (company-issued equipment rocks! ), it's essentially the same as the VIXIA HF S200 I've used in the past. 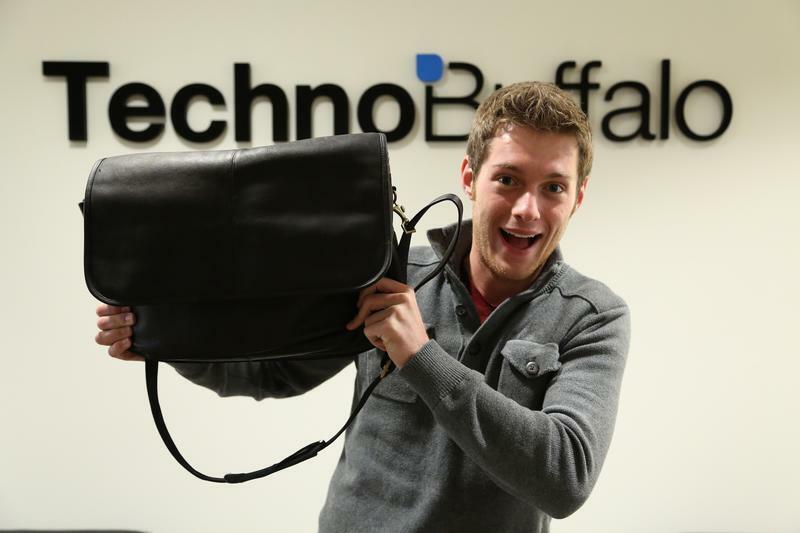 For Christmas, my girlfriend gave me an awesome briefcase that I'll be putting to the test at CES. It's leather, brown, and awesome (see picture). It holds all of my goodies and papers, and even a few spare chargers. I love technology, but I also like to write things down. I'm the king of going through multiple legal pads every quarter, and I almost always shelve them so I can reference them when I need to. They're great for meetings and for when the trusty laptop battery dies. Plus, I like to write every now and again to remind myself that I can still do it. I'm in meetings and one-on-one events non-stop from the moment we land in Las Vegas. I also love coffee and use it to keep me awake during a week in which five hours of sleep is considered abnormal. This prevents my breath from smelling like a nasty, foreclosed Starbucks coffee shop.